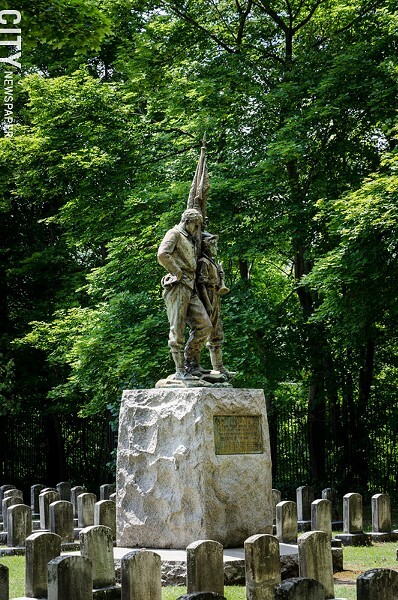 PHOTO BY MARK CHAMBERLIN This monument presides over the Civil War burials in Mount Hope Cemetery. 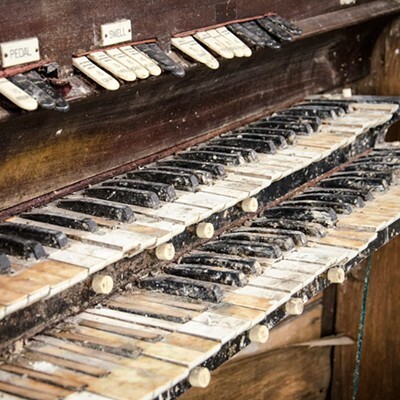 One look at the organ's arthritic keys and crumbling casing tells you that this old instrument has hummed its last hallelujah. 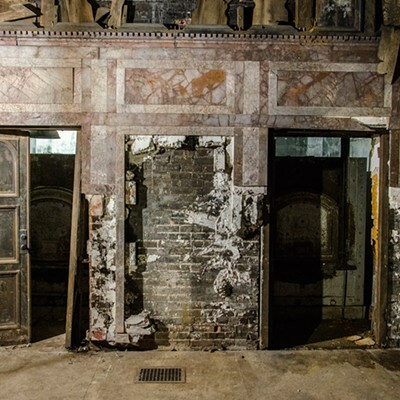 The entire chapel, known as the 1912 chapel at Mount Hope Cemetery, is a gorgeous, decayed thing — a survival-horror movie set waiting for a location scout. 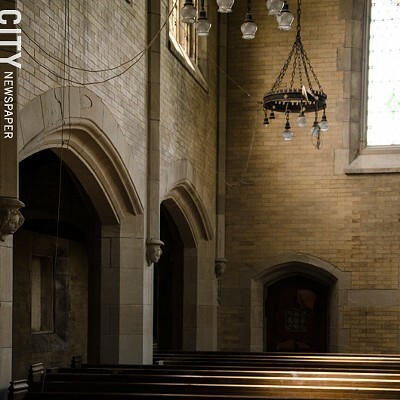 It's one of two defunct chapels in the cemetery — this one located not far from the cemetery's south entrance — which City of Rochester officials hope to restore and put back into use. "There's a lot of potential opportunity," says Mary Gaudioso, the city's assistant commissioner of environmental services. "People are always looking to have events. For some reason, weddings are very popular at cemeteries." 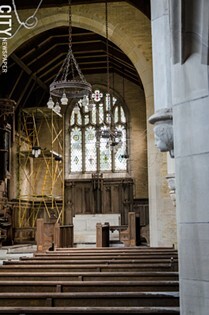 The chapels are being looked at as part of a comprehensive planning process under way for the entire 196-acre cemetery. The master plan will provide a vision for the cemetery's buildings, grounds, landscape, and vegetation going out 20, 25 years. 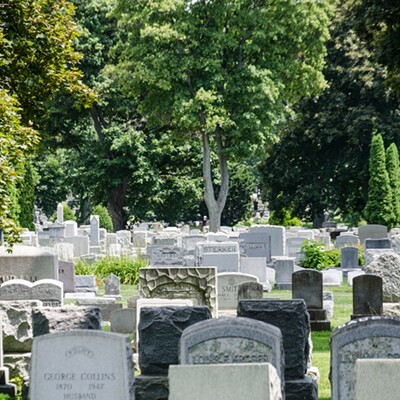 The plan will look at how to accommodate people's shifting preference toward cremation in place of full-body burials, how to preserve and enhance the cemetery's landscape, and how to keep the cemetery active as long as possible. People tend to think of Mount Hope as a historic cemetery only, Gaudioso says, because of the notable people interred there, including Susan B. Anthony, Frederick Douglass, and Nathaniel Rochester. But Mount Hope handles about five interments a week, she says. At that rate, she says, the cemetery can remain active for about another five years. But they might be able to squeeze out an additional 15 years or so, she says, if they make use of some undeveloped areas, decommission unnecessary pathways, or narrow some roads. A critical part of the master plan will tackle the cemetery's problematic tree population. 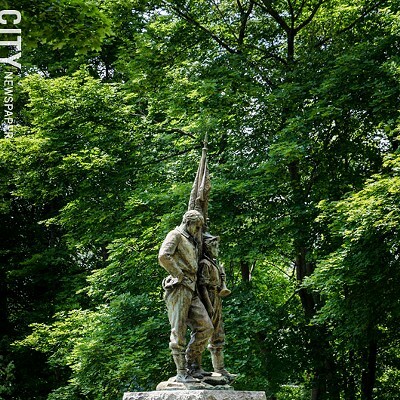 Mount Hope's rolling landscape and lush tree canopy are vital to the cemetery's serene, park-like atmosphere. Unfortunately, many of Mount Hope's trees are invasive Norway maples — planted at a time when few people knew about the damage caused by invasive species. 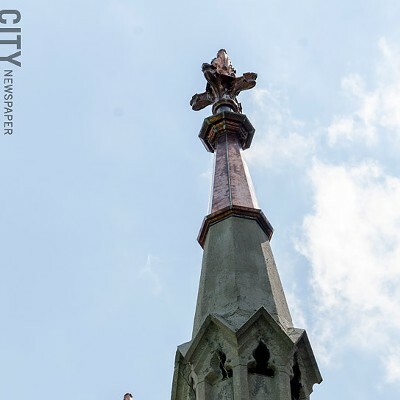 Many of the Norway maples are old and declining, Gaudioso says, and if city officials replace them all at once, it would significantly alter Mount Hope's appearance. Maybe it's the vengeful Biblical quotes scrawled on the inside wall or the small brick alcoves that once held the bodies of people unfortunate enough to die when the ground is frozen, but Mount Hope's "old" chapel, located just inside the cemetery's north entrance, is much creepier than the 1912 chapel. George Eastman was cremated here in the crematorium at the old chapel, and after Frederick Douglass died in February, 1895, his body was stored here until the ground thawed. 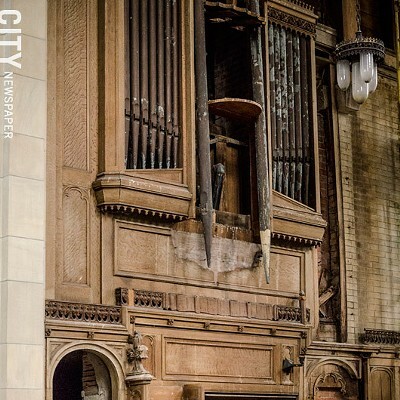 The city is doing what it can to maintain the two chapels, Gaudioso says, until the master plan is finished and funding found to rehabilitate them. The plan will identify potential funding sources for the recommendations it makes, she says, as well as how to phase-in the different aspects of the plan. 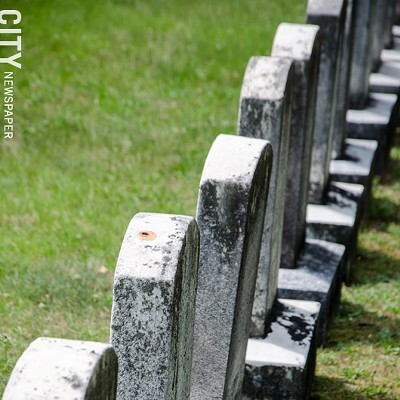 Mitch Rowe, the city's buildings and parks director, says that the master plan may also help the cemetery achieve a national historic designation, which could bring in more funding. The older portion of the cemetery, the north side, is in a preservation district, he says, which provides certain protections. The newer, south side, for the most part, does not have a historic designation, Rowe says. 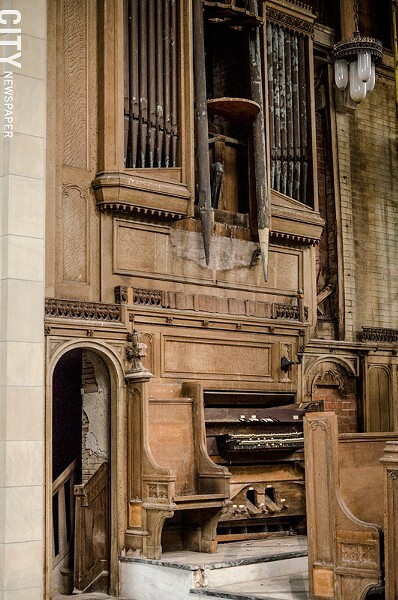 Dealing with historic landscapes is analogous to dealing with historic buildings, says Caitlin Meives, preservation planner with the Landmark Society. "Landscape is still a piece of design," she says. "You want to maintain the integrity of the design and make sensitive changes when you need to." The cemetery is being divided into different "landscape character zones" to make sure each section's individual needs are addressed. The zones are based on topography, layout, vegetation, visual character, and other traits, Gaudioso says. "This is not a generic master plan for the whole cemetery," she says. "They're going to do their analysis based on each of these areas." Development of the plan is being led by Hunt Engineers, Architects, and Land Surveyors of Horseheads, New York, and a project advisory group is helping guide and shape the process. 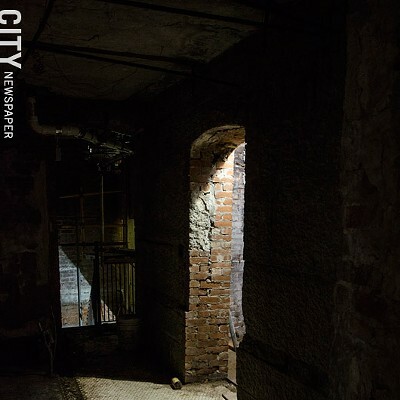 The group includes neighborhood and merchants associations; Wayne Goodman, executive director of the Landmark Society; Ed Doherty, the city's former commissioner of environmental services; the Friends of Mount Hope Cemetery; the University of Rochester; and others. A draft of the plan should be ready by the end of the year, Gaudioso says, at which time the city will likely seek public comment. The final plan should be ready by June 2016.